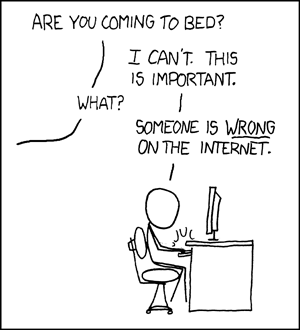 I began arguing on the Internet some twenty-seven years ago. I haven’t stopped yet. At first, it was all about the Usenet newsgroups; later it was mailing lists–private and public, online conferences, blog posts, blog comments spaces, IRC channels, Facebook and Twitter timelines. I read, I wrote, I flamed; I was read, I was flamed. I was infuriated, I was provoked; I infuriated, I provoked. No matter where you went in cyberspace, there you were, arguing with someone. And these interlocutors, they drove you batty. You knew they were wrong; they knew you were. (You both cared what your audiences thought of you.) You wrote quasi-treatises, clear and limpid in their rhetorical and dialectical simplicity; they were free of argumentative fallacies; they were responded to with obfuscation and intellectual dishonesty. Your interlocutors’ arguments were so aggravatingly wrong that at times you suspected you could not unpeel the layers of provocation they laid on; you began to doubt whether you could do an adequate job of unmasking these imposters. You thought your extensive catalog of this world’s intellectual sins and charlatans was complete; your experience with the folks you argued with online demonstrated that many more entries needed to be made in it. These folks online, friends and strangers alike, they were not like the ones you met and talked to in person. When those folks spoke, their words were transient, evanescent; they came and went, vanishing, leaving only some traces, sometimes bitter, sometimes pleasant, soon to be overwritten by some new stimulus. These folks online, their words were written; they were committed to ‘memory’ of several kinds; they acquired a permanence; they became lasting accusations of the lack of all kinds of uprightness and rectitude; you were indicted of a multiplicity of sins. Sticks and stones could break your bones, and these words, by virtue of their durability, threatened to do as much. So there it stays, that unanswered comment on your blog, the idiotic comment on your Facebook page, that chirpy, offensive tweet, burning a hole in your cranium, threatening to keep you awake as the full horror of its being read by every single user of the internet slowly dawns on you. You draft your reply as you go about your day’s business, waiting for the moment when you will be able to pour out your furious rejoinder, your nail-in-the-coffin response that will seal the deal once and for all. But it won’t. And you know it. Another cycle awaits. Letting that ‘last word’ remain unanswered is key, of course. The expert internet user comes to size up, quickly enough, what kind of creature his interlocutor is. Most importantly, is he the kind who will let you have the last word? If not, step away from the keyboard. No one cares very much; there is a lot to be distracted by; something will come along, sooner rather than later, to divert the attention of us all. Let the evidence of your inability to come up with a witty rejoinder, a snappy response, an exposure of the operative fallacy, a devastating demolition job on a weak argument persist; let it remain as an example of how not to ‘win’ an internet argument. Few listen to such good advice. I often don’t. Sometimes I will let the last comment on a Facebook thread or a Twitter thread bother me, insidiously burrowing its way around my anxieties and insecurities, before, finally provoked, I snap and respond. But I have some cause for optimism too; I have often found it easier to just terminate a conversation; I have grown wiser about the demands on my time and energy that these endlessly prolonged conversations can make. Simple economic prudence rules the roost; here may be found many zero-sum games, extracting costs that will have to be paid for somehow, elsewhere in my commitments. So, I have walked away from fields of battle. I have let my partially composed and insufficiently pungent replies die on the vine; I have left my sword buried in the ground. I have let opposing generals come out on the battlefield and reassure themselves after they have surveyed it that they have seized the day and the moment and bested their opponents, who have slunk away under cover of the night. I am content to let them think me lacking in all manner of intellectual qualities. I’m busy writing this post instead.